As you can tell by my 25 Before 25 and Goals for 2015 lists, I like making lists of things I’d like to do in my life. I’ll admit, I’m somewhat slow at achieving some of these goals (and just plain lazy on others), but I feel as though having them public on my blog makes me more likely to actually do them at some point so that I can document the moment… in most cases. Despite all the things I want to do in my life, there are quite a few things that I have no desire to do. I figured since I like to share my bucket lists with you all, I might as well share my anti-bucket list as well. Get a pet rodent, ferret or snake. Honestly, I don’t get the point of pets that don’t cuddle with you, like kittens or dogs. In that case, I might as well add birds to this list too. And I’m not saying you can’t cuddle a ferret, I’m sure most ferret owners do, but they’re not my kind of animal to have as a pet. Go to law or medical school. I just have no desire to become a lawyer and/or doctor… plain and simple. Become famous for singing. I’ll stick to singing when I’m home alone or driving by myself. Finish watching the Twilight movies. After the tragedies that are the first two movies… no thanks. Go skydiving. I am in no way adventurous and this just seems like a risk I could never take. Go to a Miley Cyrus or Justin Bieber concert. Not even if you offered me millions of dollars. Be a contestant in a cooking competition. Please, the only thing I can make at the moment is spaghetti sauce… plus I have no desire to learn fancy recipes that will impress foodie judges. Go a month without my phone. I mean, I can go without looking at it for a day or whatever, but for a month? Heck no. Do a TED Talk. They can be interesting, and I’m sure someday I’ll have something interesting to share… but I hate public speaking, so… nope. Go backpacking in Europe. I’ll visit Europe someday, sure, but I’m not about to travel with only a backpack and have no idea where I’ll end up next. Get a root canal. After seeing the pain my mom endured after having one… no way man. I’ll just yank the tooth out if it ever comes to that point and get a fake one later on. Gamble in Vegas. Not really my scene or something that I have a burning desire to do in life. Learn to surf. I don’t even really like going to the ocean, period. I’d rather take up snowboarding or skiing first. 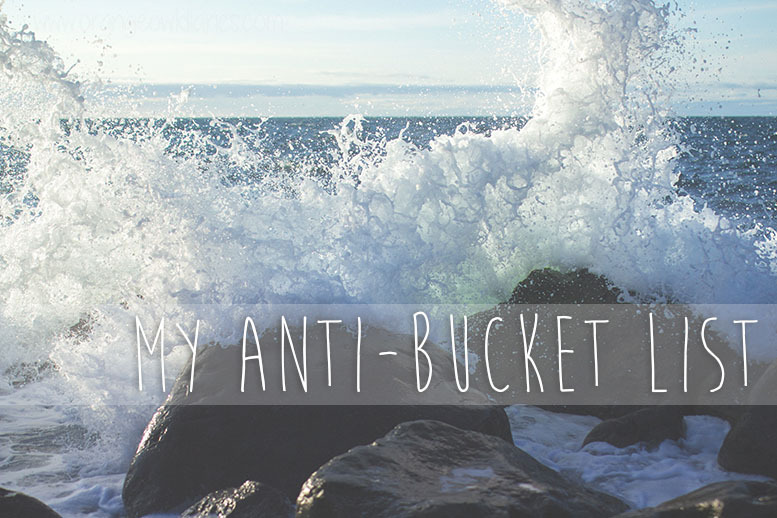 Now I’m wondering, what’s on your anti-bucket list? Are any of them listed on mine? Haha, I couldn’t do it. I mean, I’ll admit there are a few Bieber and Cyrus songs that I like… but I couldn’t endure the live shows. Yeah, I would have to say I agree with pretty much the whole list. I had a pet mouse once (a white one) and he was the best. I also definitely want to go skydiving! On my no-way-no-how list is dance on stage. I mean, I did choreographed dancing when I was younger (teens) but now? Never. What was his/her name? I mean, I don’t hate those kind of pets, it’s just not me. Mm, I’m with you on that last one! I danced for 6 years as a kid, but no way I would do that now.